You will find the Social Share settings on your WordPress admin area navigating to the GamiPress menu -> Settings -> Add-ons tab. From this settings you can configure the automatic display of the share buttons on the whole website. Checking this option will enable the automatically output of the share buttons. This option sets where share buttons will be placed automatically. Available options are: After Content, Before Content or After and Before Content. This option sets the post types where share buttons will be placed automatically. 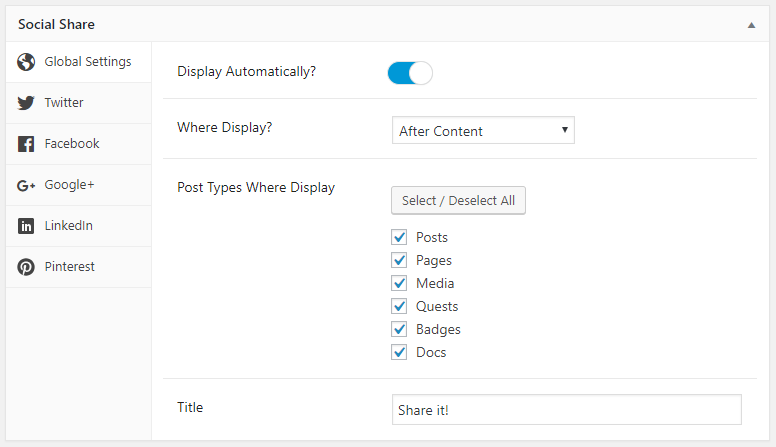 This setting will display all post types that has public access in your site, like WordPress default posts or pages as well as WooCommerce products. Text to show before the share buttons. On each social network tab, you will find the configuration settings for each social button.